Please scroll down for online directions to the Funeral Home and service details. 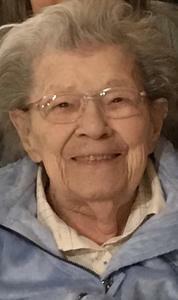 Passed Away on December 29, 2017, age 94 years. Preceded in death by her husband Harold and daughters: Carol, Lela, Mary "Sue" and Nancy. Beloved mother of Sally (Warren) Kirchmeier. Cherished grandmother of Warren, Jeffrey, Jacqueline (Billy), Jennifer (Corey), Tommy and John. Dear sister of Lorraine, Richard, and Jeanette. Further survived by many other grandchildren, great-grandchildren, other relatives and friends. Visitation at the Niemann / Suminski Funeral Home, 2486 S. Kinnickinnic Avenue, Milwaukee, WI 53207 on Saturday January 6, 2018 from 11:00 AM until the time of Funeral Services at 1:00 PM. Interment Sunnyside Cemetery, Lannon, WI.